Today was the first day of Week of the Young Child, and in addition to Hat and Sunglasses Day (which made the children crazed with happiness), we had an ice cream social that evening. My director’s brilliant move was to have an ice cream truck come. Awesome! We didn’t have to estimate how much stuff we’d need or serve it, and there was nothing to clean up when it was over. Granted, it was 44 degrees out, but the kids didn’t care and the grown-ups all thought it was hilarious to be eating ice cream when we were freezing. Good stories never come from happy times, y’know. And I think ice cream is good any time of the year! Did that truck have any white popcicles? That’s my favorite and they are very hard to find. 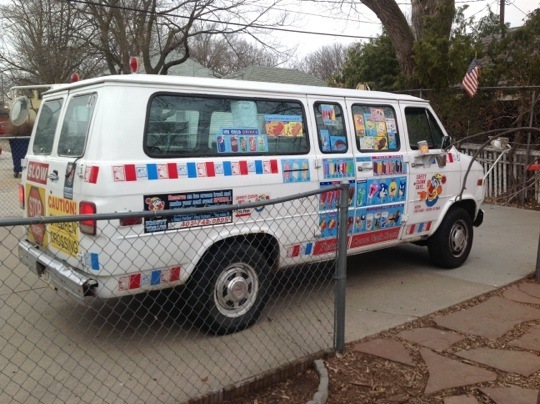 I don’t have many memories of ice cream trucks as a kid. I do remember the red, white, and blue rocket popsicles. I wouldn’t say that’s my favorite, but the eye-appeal was very high. We only have one ice cream truck that comes around our village- they sell gelato! We do have a bakery truck, a meat truck, and a vegetable truck. So I should not complain, but I do miss the bomb pops that Brad is referring to. My favorite! Ha! Yes, we live in a willage and we love to drink wodka.